Gold standard for your guns. Also great for vehicles, boats, ATVs and more! Chosen by the U.S. Military! 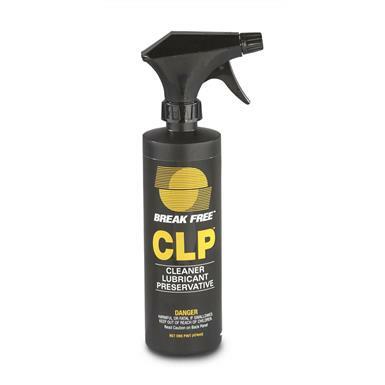 Break-Free CLP Gun Cleaner is the unquestioned gold standard for cleaning, lubricating and protecting your firearms. Also great for motor vehicles, boats, ATVs, tools, household appliances and more. Break-Free CLP 16-oz. Gun Cleaner/ Lubricant/Preservative is rated 4.9 out of 5 by 43. Rated 5 out of 5 by streetpockkid from This is a large container. I've been using this product for years. Stays lubed in my pocket, and on the Street! Rated 5 out of 5 by David from Shipping improperly I wrote a review a few days ago but it was never posted. I received an order with a 16oz. bottle of Break-Free CLP that leaked out. There were three other items in the order but luckily they were not damaged. The CLP was shipped with the sprayer installed, not capped. I notified customer service and in two days I received a replacement bottle. FANTASTIC! No leaks this time but they are still shipping the 16oz. bottle with the sprayer installed, no cap seal. I do love this product. CLP is the best. So is SG’s customer service. Rated 5 out of 5 by SHOOTER13 from Great Size...Great Price I've been a user of Break-Free CLP for as far back as I can remember...and it has never failed to Clean / Lubricate / Protect all my firearms. But, it always seemed that I could never find a bottle sized bigger than 4 fluid ounces...until now !! The two 16oz containers I've recently purchased are a great size at a great price...and the Buyers Club Membership I have rushed them both to me with free shipping ! !Both of the containers come sealed with a bottle cap and also provide a pump spray feature to boot...which means I can recharge the 4oz bottle for my range bag and have the other bottle on my reloading bench at the ready.Thanks Gary !! Rated 5 out of 5 by Scott L from Can't beat Sportsmans' price I started using this 30 plus years ago and still find it to be my go-to for lubricating and long term rust-free storage of anything metal. This is a convenient size and you just can't beat this price! Best value for CLP/Break Free I have ever found. Rated 5 out of 5 by BigBri from made the job easy only used it once. just acquired an old 2nd gen glock 19 that only received basic cleaning. broke the gun down gave everything a good spray let it sit and with little effort years of range time wiped away. Perfect for shaving, detail cleaning and lots more.